Alex Murphy announced his arrival at the top of Irish swimming when he qualified for the World Championships with a gold medal-winning performance in the 50m breaststroke on the opening night of the Irish Open Championships in the National Aquatic Centre. 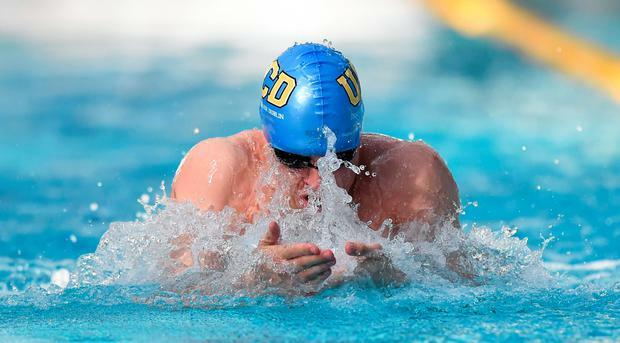 The 19-year-old UCD swimmer joined Fiona Doyle, Sycerika McMahon and Open water competitor Chris Bryan on the team for Kazan (Russia) this summer when he clocked a qualifying time of 27.58 in the final after going close in the semi-finals with 27.62. Murphy said: "I wanted to get the time in the semi-finals. When I didn't get it I was disappointed and wasn't sure if I could do it in the final but I went for it and am really pleased with the result." Larne's Danielle Hill set an Irish junior record in the semi-finals of the 100m backstroke, her 1:04.12 knocking one tenth of a second off Jane Roberts' record. London Olympian Grainne Murphy returned to national level swimming with victory in the 800m freestyle. The Wexford swimmer led from the start to win in 8:43.37 ahead of American Kendall Brent (8:46.70). Teenager Antoinette Neamt was fourth in 8:48.31. Brendan Gibbons won the 1500m in 15:51.34. He touched in third place behind American swimmers Matthew Hirschberger (15:29.08) and Gavin Springer (15:50.90). Brendan Hyland retained the 200m butterfly national title for the third year running, recording a time of 2:00.29 - over a second off his Irish record of 1:58.68. Lisburn's Rachel Bethel claimed the 200m freestyle. She was the first Irish swimmer home in 2:03.72. In the men's event Dundalk's Brian O'Sullivan touched in second place in 1:52.62 behind Denmark's Frans Johannessen (1:50.82).